The Michigan State Numismatic Society (MSNS) Fall Convention and Coin Show was held November 28-30, 2003 at the Hyatt Regency Hotel in Dearborn, Michigan. I went the opening day. As is my practice, the first table I visited was Norm Talbert’s (Great Lakes Coin Company). Norm is an MSNS member and an authority on Buffalo Nickels. 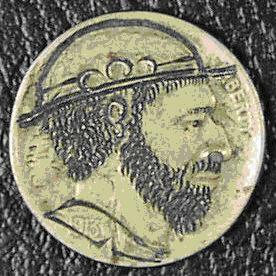 Norm is also a member of OHNS (Original Hobo Nickel Society) I had brought a couple of U.S. Type coins I wished to sell, which I handed to Norm for his examination. Then I saw the four hobo nick els Norm had in one of his display cases. I began examining the hobos. I was definitely interested in one of them. As I was examining the hobos, Art Delfavero walked up. He asked to see the hobos I was viewing. Art introduced himself, and pretty soon the three of us (myself Art and Norm) were talking about Hobo nickels. Norm shared with us some of his dealings with Del Romines many years ago. I found out Art was both a collector as well as a modern hobo nickel carver. I ended up purchasing two of the hobos from Norm and Art bought a third. Pictured are the two I purchased. The first was carved on a1913-S buffalo. I was intrigued by the small head on the second of the two hobos. Art told me to be sure and check out the hobos being offered in the MSNS auction conducted by Craig Whitford Numismatic Auctions. 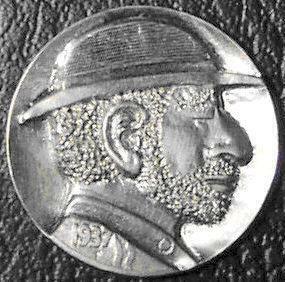 I did just that and put my bid in on the below pictured hobo nickel which I was fortunate enough to acquire. I believe the carver may be "Flat Nose." 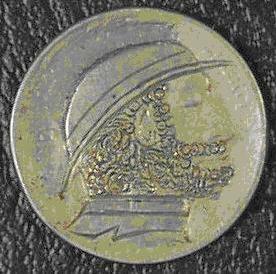 (see page 53 of the Steve Alpert’s Hobo Nickel Guidebook). I later found out that I had outbid Art for this particular nickel. After placing my auction bid, I went upstairs to the MSNS Hospitality suite. I had heard that Rita Jene Sledz was the hostess. Rita Jene is well known to MSNS and OHNS old-timers, but was someone new I wanted to meet. Rita Jene is an avid hobo nickel collector and regular attendee at the OHNS Annual Meeting and auction at the FUN Show. She shared some of her hobo knowledge with me, and we had a great discussion. I was able to show her the two nickels above that I had acquired from Norm Talbert*. I found out later that Art was able to go back to the MSNS Show on Sunday, and Rita showed him several hobo nickels that she had acquired a couple of months earlier. 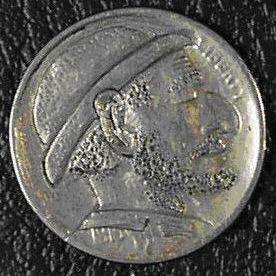 (By the way, I was able to view Rita’s hobo nickels at the Spring 2004 MSNS show in Lansing, Michigan.) Art Delfavero and I have stayed in touch and he carved the hobo nickel on the left for me this Spring. Art is known in hobo carving circles as "Cinco de Arturo"
For me the MSNS show was the best ever, not because of the nickels I purchased, but having the opportunity to meet Art and Rita as well as talk to Norm about hobo nickels. I hope many of you will get the chance to meet other collectors and dealers who have interests in your field(s) of numismatic interest at a future MSNS event. *Sadly, as a footnote to this article, Norm Talbert passed away suddenly on May 30, 2004.